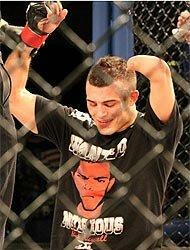 Nick Newell's aspirations are no different than those of hundreds of other mixed martial arts fighters: make it to the UFC, win a championship, become a star and be recognized as the best in the world. Newell, 26, is making steady, if slow, progress. He's a 7-0 lightweight with six finishes, all in the first round. His competition level hasn't been particularly good – Chris Coggins, whom he beat April 13 by majority decision, is the only man he's faced who had a winning record – but a fighter can only beat those who are put in front of him. "I'm in this to be the best and nothing else," Newell said. Newell's situation is different than most, however. He's a congenital amputee, born with a left arm that ends about three inches past his elbow. At a time when MMA is still begging for widespread acceptance and the owners of the UFC are pouring tens of millions of dollars into a lobbying effort to legalize the sport in New York, Newell's condition makes him stick out like a lightning rod. He is desperate to be known for what he does in the cage, and not for something he has no control over, but he understands that his condition is part of his extraordinary narrative. "Obviously, I would love to be judged and recognized solely as a fighter and for my skills, positive or negative, as a fighter," Newell said. "But I know that I'm known as the guy with one hand who fights. But that's OK. If I go to get a cheeseburger, I'm the guy with one hand who is eating a cheeseburger. It's how people view me, but I'm more than that." Jeremy Libiszewski has trained Newell for seven years, and said he's watched him develop from a guy "who couldn't strike, who couldn't grapple," to one who has more than held his own with UFC veterans in sparring. Libiszewski said Newell's disability isn't discussed and is barely noticed around the gym. Newell's coaches and training partners only talk about it when they're asked. Though Newell's technique was crude when he first arrived, Libiszewski had no doubt that Newell, a college wrestler at Western New England, would be able to become an MMA fighter. "I knew the first day he walked in that he could do it, if that's what he wanted," Libiszewski said. "To me, it's not the skill level so much as the mental mindset that separates those who make it from those who don't. If you really want it, you can do it. That's true in pretty much anything. "If you aren't the most talented kid in the world, then you have to make more sacrifices. Nick is a good athlete and he picks up things quickly. And he wants it. He wants it very, very badly, and so it wasn't that hard, honestly. People think it would be very difficult, but it wasn't. He's a legitimate fighter now." Newell has adapted his fight game to suit his physical skills. He can't use his left arm to punch, but he can throw elbows with it, much like UFC star Urijah Faber did in a World Extreme Cagefighting title match against Mike Brown at WEC 41 in 2009. Faber broke his hand and couldn't punch, so he threw short elbows at Brown from the inside. Newell can use his left arm to block punches, and the only concession he has to make in his wrestling game is that he needs to get deeper on his shots. "When I shoot, I have to get in a lot closer to get a takedown," Newell said. "I have to be deep. Some can get a takedown from far away, but I need to get in more." Tim O'Connor, one of his co-managers, was skeptical when he was approached about representing Newell. How, he asked, could a one-handed fighter be successful against the best competition in the world? But it didn't take long for O'Connor to be swayed. Newell is able to defend himself as well as any other fighter and should be regarded no differently than anyone who has all of their limbs intact, he said. "Eventually, I think he's going to be able to do this at the highest level, I truly do," O'Connor said. "When I first watched him, I'd think, 'There's no way,' and every time I would have a negative thought, he'd do something to prove me wrong. He can't throw a jab or a cross from the left side, but he's learned how to adapt and he's at no disadvantage from anyone else." Licensing Newell likely won't be an issue, though that's not the case for all fighters with a disability. Nick Lembo, the counsel for the New Jersey State Athletic Control Board, said he'd have no problem licensing Newell in New Jersey. Licensing fighters with amputees is a growing issue for regulators because soldiers are returning from Iraq or Afghanistan missing limbs but looking to fight. Some of them, as an example, have titanium legs. They could box with a titanium leg, but can't compete in MMA where kicking is allowed. 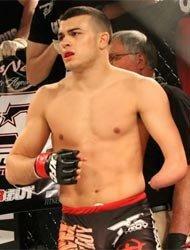 The most famous disabled MMA fighter is Kyle Maynard, who is missing both forearms and his legs end above the knees. He fought in a highly publicized amateur bout and is now a motivational speaker. Anthony Robles won the NCAA Division I wrestling championship at 125 pounds for Arizona State in 2011 despite being born with one leg. Many have encouraged Robles to try MMA, though he has so far not done so. In order to let amputees fight, in some cases the rules have to be adjusted. As a result, Lembo stressed the importance of evaluating each fighter on a case-by-case basis, but he has seen Newell fight in person. "As far as Nick goes, he's able to protect himself, you don't have to change the rules for him and he's not a risk to his opponent," Lembo said. "If anything, I think he may have a little advantage when it comes to the ground game because he uses that arm fantastically to dig in chokes. He can sneak it in there easier, in some cases, I think, than a fighter who has a full arm. He's perfected that." So, for Newell, it's all about getting better and hoping to one day get that call from UFC president Dana White or UFC matchmaker Joe Silva. Until then, he's doing what he always does: working. He wasn't pleased with the way he fought against Coggins and quickly was back in the gym. "He has such a great work ethic," Libiszewski said. "He wants to be great and he is willing to do what it takes. He came back immediately after that fight and said, 'I know what I did wrong and I know what I have to do to get better.' I think he's already ready to compete on a Bellator, Strikeforce type of level now, and I don't think it's too much longer, if at all, before he's ready for the UFC." Whether Newell fulfills those dreams and becomes a UFC star is unknown. Like so many others, he probably only needs the opportunity. He is, potentially, one phone call away.